Revolver Music5 review | What Hi-Fi? The ‘loudspeakers' section of this website's Reviews section is bigger than most, but not a single pair of Revolver speakers is represented there. It's an odd state of affairs for such a stable brand, but if these Music5 floorstanders are anything to go by, the Revolver name is due to re-establish itself in some style. Fairly compact, nicely proportioned and sporting a purposeful driver array (26mm metal-dome tweeter and three 165mm drivers, two of which are charged with low-frequency reproduction), the Music5s are glossily finished to a decent standard. Biwireable speaker terminals and a rear-firing bass reflex port complete the on-paper highlights. Performance-related highlights are numerous, too. The Music5s are a personable and engaging listen. The midrange fidelity granted to Luscious Jackson's Fever In Fever Out means every inflection and mannerism in the vocal is delivered in full – in fact, there's similarly explicit detail throughout the frequencies. The top end is judged well – the crisp attack never threatening to tip into harshness – and the Revolvers integrate all those drivers with equal confidence. Dynamically adept and with sufficient scale to fill larger rooms, the Music5s present a convincing stereo image. The Revolvers demonstrate an unfussy even-handedness that makes them comfortable with a wide range of musical styles. A switch to The Roots' How I Got Over reveals the one chink in the Revolvers' armour. Low frequencies, while plentiful and tonally articulate, don't quite have the straight-edged definition the song demands – as a result, there's a softness and pliancy to bass sounds that suits the Music5s' unthreatening demeanour but robs music of the last drop of punch and drive. Don't let that blind you to the Music5s' many charms, though. As long as you avoid partnering them with similarly lush, easygoing electronics, the Revolvers are gloriously easy to live with on a day-to-day basis. 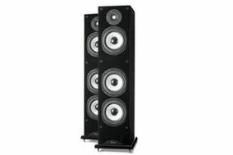 They're fine all-rounders and a welcome addition to the fairly short list of five-star floorstanders around at this price.